Long-term sub, Ms. Wallace, helps a student prepare and review for the student's next timed write. Ms. Wallace replace Ms. Cooper who left on maternity leave on March 18. Ms. Starr reviews and grades classwork for her A.P. Literature, Honors English II, and English II students. The new Long-term sub, Ms. Starr, stood in to replace Ms. Klingbeil who left on maternity leave in February. Both Ms. Tucker and Ms. Klingbeil needed to go on maternity leave. Luckily for the school, Megan Starr, also known as Ms. Starr, stood in to teach the English II, Honors English II, and A.P. Literature students. For more than a month now, Starr has been teaching at San Juan Hills and will continue to do so till the end of the year. Starr is not just teaching at San Juan Hills, currently she is also teaching Shelly Gustufson’s class at San Clemente High School. This isn’t even Starr’s first venture into long-term subbing at the high school level. “I was a long-term sub at San Clemente High School for IB Literature, Honors English II and English II Collab. I was also a regular sub during my time student teaching at SCHS from January 2018-April 2018. Then I took over AP Lang and ERWC for fall semester (at San Juan Hills),” said Starr. For Starr, being a long-term sub is more than just stepping in to replace a teacher who has to leave temporarily. Being a long-term sub has to ensure that the students continue to learn even after their original teacher is gone. “Long term subs have such a crucial role because, depending on the time of year you take over, you know you have big shoes to fill. 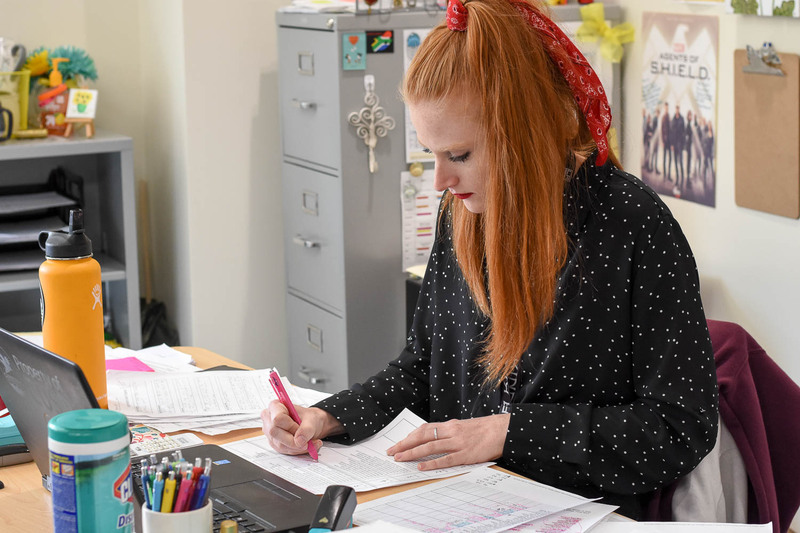 The teachers I have taken over for are some of the best, so making sure that the transition between teachers is easy and consistent is very important,” said Starr. Due to her past experiences with students, Starr is able to dealing and managing with students. “Students can be pretty tough on long term subs. There is always some push back because ultimately students feel like you aren’t their “real” teacher. Sometimes there is a lack of respect because of that. Once that testing phase is over, though, the respect is sometimes stronger because you’ve gotten through the rough times together,” said Starr. Being a long-term sub has only shown Starr the potential possibilities in becoming a full time teacher. “I have learned so much through all of the classes I have taught and the teachers I have taken over for. It just makes me want to be a permanent teacher even more,” said Starr. Starr is also considering working in careers, outside of education, that involve working with teenagers. “Eventually I want to go back to get my Masters in English and teach at the community college level. I also have a dream to go back to get my in Psychology to be able to start my own private practice working with teenagers. Very opposite paths, but still continue to work with high school students,” said Starr. For many of us, a great teacher can affect us even after we leave their class. This happened to Olivia Wallace, better known as Ms. Wallace, in high school when her freshman English teacher inspired her to become an educator herself. “I will always remember Mr. Brandts standing over my desk in 9th grade English one day, telling me that I was a strong and natural writer. Before that moment, nothing about me had ever felt strong or natural. I was a shy freshman who did not feel particularly talented at anything. Strong was never me. Until Mr. Brandts, an intelligent, capable, caring, trustworthy adult told me that I was. . . . Mr. Brandts was the spark, but my desire to teach has been growing for quite some time now,” said Wallace. After Ms. Cooper, the previous English teacher, went on maternity leave, Ms. Wallace stepped in to teach. The English department has provided a lot of insight and helped Wallace with their expertise and experience. “The English department is so welcoming. Each day a teacher has popped in my room to check in on me, and ask me if I have any questions during these first few weeks of getting adjusted. I am so thankful for such incredible support” said Wallace. The students of San Juan Hills High School have also helped Wallace learn to become a better teacher. “I love that I get to be both a teacher and a student in this profession. The students here bring so much joy to my day, and teach me about so much from the correct way to say XXXtentacion and how I can best help them learn,” said Wallace. 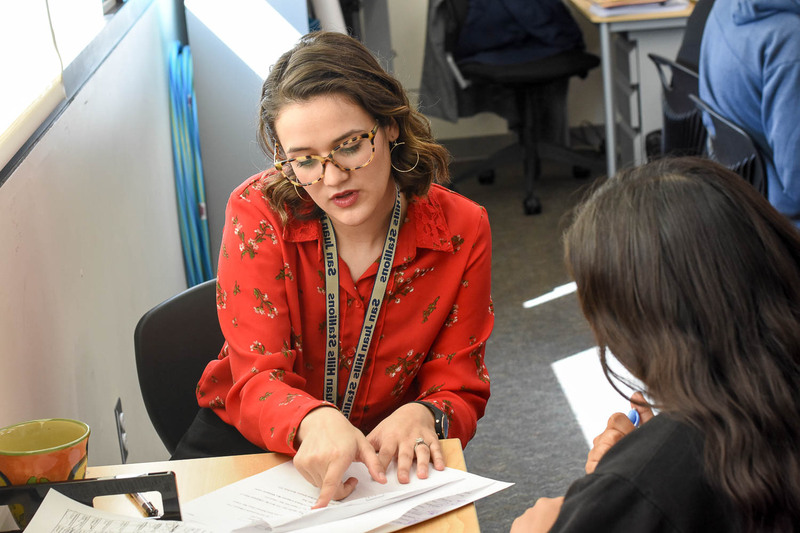 Maybe the most unexpected part of being a long-term sub for Wallace is just how much support and information the previous teacher, Courtney Cooper, had provided her with. “I never thought that I would have so many resources left for me. I thought that I would have to create new lessons each day, but Mrs. Cooper left me a lot of information and handouts. I also never thought that I would get to work with a co-teacher. Right now, I teach English II with Ms. Martinez, and it has been a great learning experience,” said Wallace. “Each day, I fall in love with the small moments of teaching: the smile of a student who always frowns, the raised hand of someone who does not normally participate, the light bulb moment of a student who is struggling. I can’t wait to fall in love with it more and more over the years,” said Wallace.